Geothermal Installation & Repair | Clarksburg WV & Bridgeport WV | Climatrol Inc.
Climatrol works hard to invest in technology and continuing education to ensure that we are able to remain at the forefront of emerging, cutting edge technologies that can help our customers save on their energy expenditures, as well as maintain a comfortable indoor climate. We are passionate about offering heating and cooling innovations to our customers in Clarksburg and beyond. 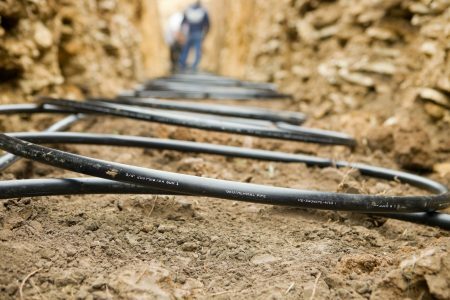 In the 1990s, the Garners worked hand-in-hand with Allegheny Power to develop and install West Virginia’s first geothermal unit (at Corton Development), and we continue to offer comprehensive geothermal installation, maintenance, and repair service for customers throughout our service area. Climatrol is proud to offer licensed, professional installation of a variety of geothermal systems -the world’s most advanced and efficient climate control systems for year-round comfort. These innovative systems are in use around the globe and utilize the power of the earth itself to provide a moderate basis for heating and cooling your home or business. The feedback that we have received for the geothermal systems that we have installed has been overwhelmingly positive. Geothermal systems are essentially a type of heat pump that accesses the constant interior temperature of the earth the decrease how hard your heating and cooling systems have to operate, therefore drastically reducing your energy bills. For each unit of energy consumed, several units of heating or cooling power are delivered. The system is highly efficient, effective, has a reputation for extreme durability, and is well-known as a very cost-effective investment. Geothermal systems provide a steady, comfortable interior climate that provides both the ideal temperature and humidity levels. These compact and unobtrusive underground systems are silent and do not blow dirt, pollen, mold, and other allergens and contaminants around your home. If you would like to learn more about how our geothermal systems work and how we can integrate one of these exceptional, money-saving units into your home or business, let us know. We offer complimentary quotes and are available to answer all of your questions. Call Climatrol at: (304) 623-0606.